Some of my most recent reads have concerned mental health and mental health care, particularly The Last Asylum by Barbara Taylor. That book focused on the end of the ‘asylum age’, a time when psychiatric care was moving away from institutionalising patients and instead beginning to emphasise community care and outpatient care. That was the late 1980s and early 1990s. Susanna Kaysen experienced the asylum age when it was in full swing, in the late 1960s. She was an ‘unstable’ teenager who had an affair with her high school English teacher, and she was admitted to a psychiatric hospital with a suspected case of borderline personality disorder. You may have seen the excellent film adaptation of Girl, Interrupted with Winona Ryder. If you have you’ll know that Susanna wasn’t an extreme case, like many of the girls she met in hospital. She wasn’t obviously psychotic, or suicidal, and compared to the other girls she sometimes seems completely sane. Susanna was diagnosed with borderline personality disorder, and the amazing charity Mind have a page on it here that adheres pretty much exactly to what Susanna describes in the book. I think many people will have experienced feelings/symptoms that are similar to BPD, but that doesn’t mean we all have it. It also means it can be difficult to diagnose and/or treat. After all, Susanna was 18 when she was amitted into the hospital, an age when we can act strangely and not be sure of ourselves. But she certainly was unwell, and her later clarity means that she is able to see this, and examine her experiences thoroughly in hindsight. Susanna’s case papers are included sporadically throughout the text, grounding her experience in reality, and yet making it surreal at the same time – these documents are from another era, another world than our own. But they are fascinating, and give real insight into the American mental health system at the time. I thought this was an excellent touch, and was glad these old documents were included. I also loved the structure and pacing of the book. It is not entirely chronological, but this doesn’t matter. Each chapter is based around a theme or event in some way, and with this method Kaysen is able to cover all the ground I’m sure she intended to without getting bogged down in ‘this happened, and then this’. It is a portrait, a snapshot, an examination. It is an overview of what it felt like to be ‘interrupted’. Alongside the story of her incarceration, Kaysen diverges off into relevant tangents that create context and background to her story, and, in one of my favourite chapters, explores the difference between ‘brain’ and ‘mind’. I found this fascinating and thought that it added depth and psychological context to the rest of the book. There are lots of succinct lines and paragraphs that I could quote and quote, which was something else I loved – unlike me, Kaysen doesn’t waffle. She gets to the point and makes it. 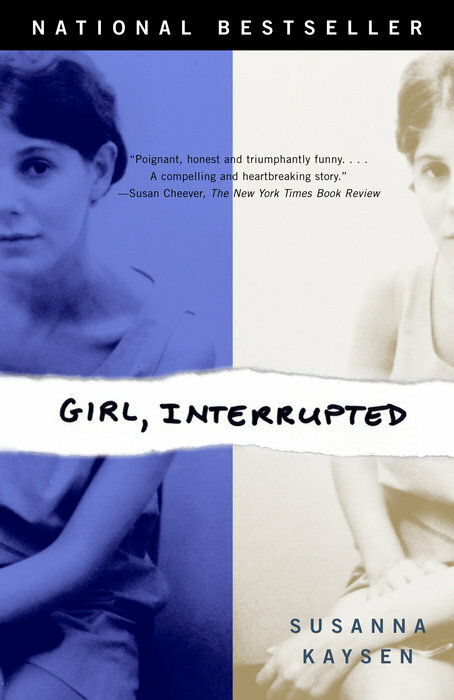 I would recommend Girl, Interrupted to anyone interested in the history of mental health and its care, and also for anyone who enjoyed the film, or who enjoys interesting and off-beat memoirs. That’s what I would call this book – an off-beat memoir. It isn’t miserable, or depressing, and it isn’t a detailed book exploring complex issues, like The Last Asylum.While we get an insight into the medical system through the case documents and Kaysen’s memories, this isn’t an examination of the use of ‘asylums’ or whatever the right word is. Kaysen does not seek to critique the system, not overtly at least, although of course we do make judgements as we learn about her experience and the experiences of some of her fellow patients (both positive and negative). Really this is a personal story, one of its time and place, but one that is extremely relatable and human. I wish I had read it when I was a teenager, because Kaysen has some great life-lesson style philosophy that really struck a chord with me. I liked her as a person, as well as liking her book. Having read it, I think it would be interesting to re-watch the film and see how they adapted all the content and characters. I would love to hear from anyone else who has read this book, or might want to. It is definitely worth it, and has taken its place among my favourites. First published in 1993 by Turtle Bay Books in the US. I read the 1994 edition from Vintage. I both saw the film and read the book. I asked my husband to read the book as well because it was a great deal like my story. I was hospitalized in 1965 and he was my then boyfriend. Knowing first hand what it was like to have ECT three times a week for six weeks, as well as insulin shock therapy, it helped him know that I was not alone in the mental health community. It made it real for him, rather than the nebulous horror it had been to see me for the first time after one week—unable to speak and quite frankly, terrified that I would remain where I was for the rest of my life. I resented the lasting effects of ECT, which was contrary to all that my parents were told about it. I don’t remember the majority of my senior year; I cannot tell which memories that remain are mine and which are simply because I was told something. The book goes into more detail than the movie and the accompanying documents bring the reality much more close. But I felt the movie did a very good job of hitting all the important points. And Wyder and Jolie were superb in conveying their character’s inner workings. Glad you have found what was, at the time, the best inside look at the mental health system—not overdramatized, not condemning—just real. Thank you very much for your personal and insightful comment. It sounds like you have an amazing story – thank you for sharing.